Since my last post I have added more outfits to the shop. This one features a sleeveless top knit in yarn made of Sugarcane. The hat is made with a cotton/wool blend and decorated with white ribbon. 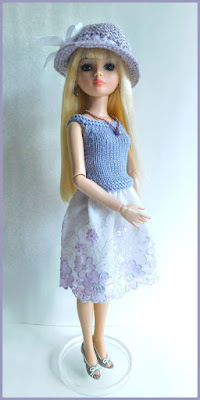 The skirt is White French Lace embroidered with lavender and grey flowers. There's a matching necklace and earrings. This one the sleeveless top is knit in an acrylic/cashmere blend yarn. The hat is made with a Cotton/Linen blend and embellished with ribbon bows and a satin rose. The skirt is white French Lace embroidered with wine and pink flowers. I've also included a belt made of ribbon and matching jewelry. The hat in this set is made with a cotton/wool blend yarn. The top is knit with an Alpaca/Rayon blend. The skirt is cotton with a yellow daisy print on it. It has elastic waist to make it easy to put on. Matching belt and jewelry included. This pink set has a sleeveless top made with a Mohair/Silk blend yarn. 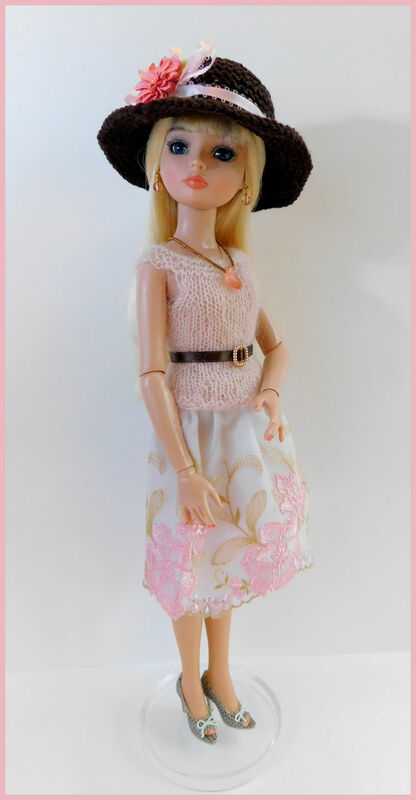 The skirt is French Lace embroidered with pink and gold floral pattern. The hat is made with a cotton/linen blend and decorated with ribbon and a paper flower. It comes with the belt made of brown satin ribbon and jewelry. 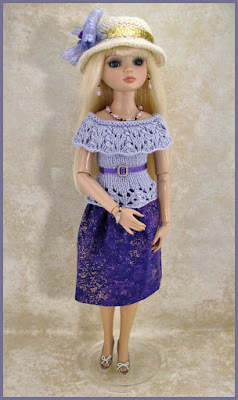 This set has a top with a lace ruffled collar made with Sugarcane yarn. The skirt is cotton. The hat is a cotton/wool blend embellished with ribbons. A belt and jewelry is included. I've got a couple more outfits almost finished. I'll post them when they're done.